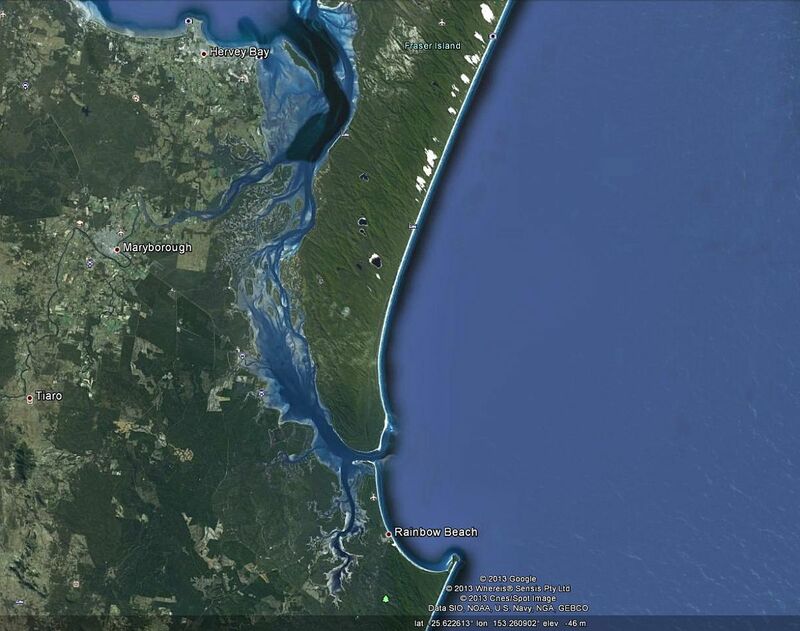 The waterways which separate Fraser Island from the mainland are known as the Great Sandy Strait. These waterways also continue south from Fraser Island but the only tidal access for this southern area is between the southern end of the Island and Inskip Point. The Great Sandy Strait is listed as a wetland of international significance and is listed under the Ramsar Convention. During our summer up to 45,000 shorebirds use the area. I live down on the most southerly part of the Strait and I watch shorebirds from Inskip Point south. 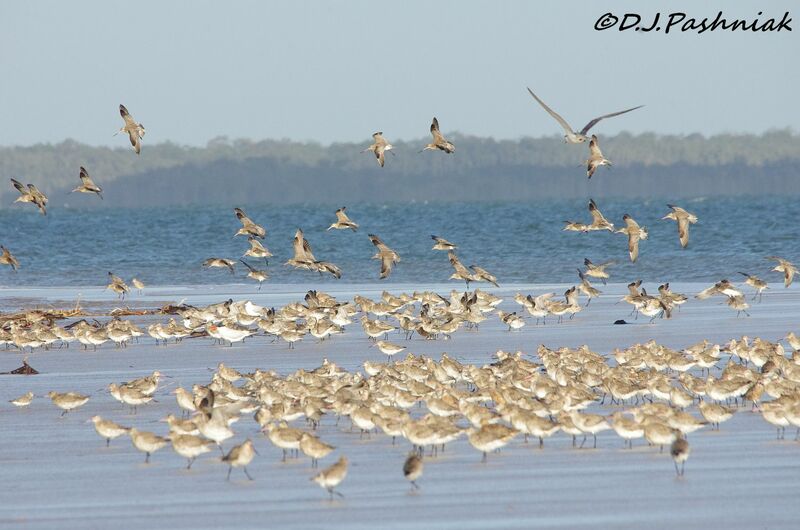 Inskip Point and the Mullens roost site are the only roosts which are accessible by land. 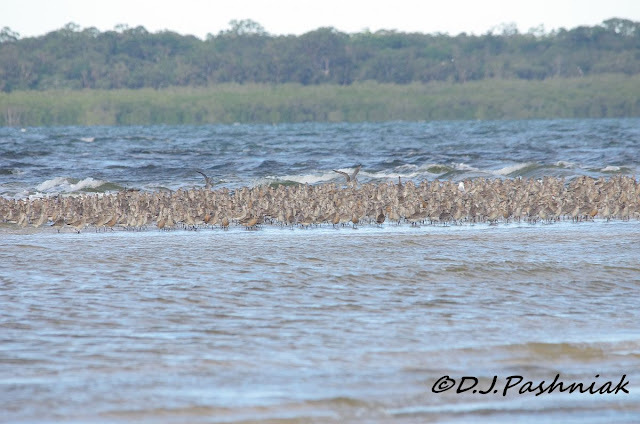 When I can't get out on my kayak I visit one or the other of these roosts to see shorebirds. 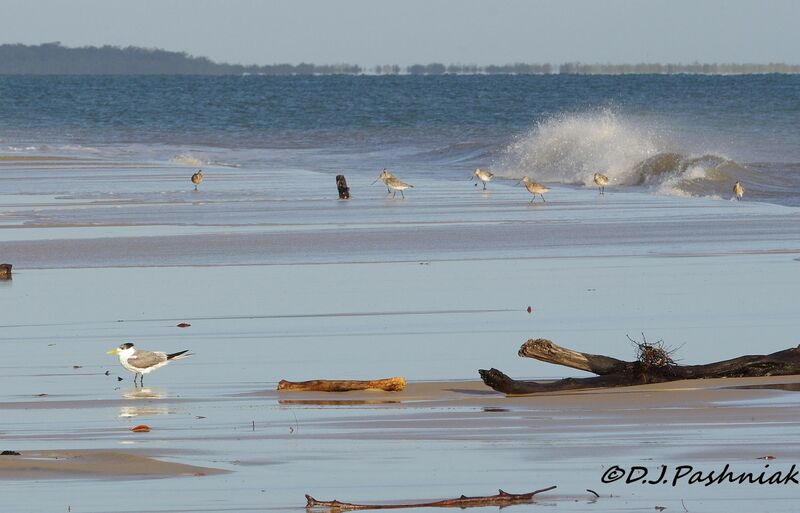 Inskip Point has the most shorebirds to see providing it is an early high tide and also providing that you get out there soon after sunrise before there is traffic across the Point. It is perfectly legal to drive across the Point as this is where the barge waits to take vehicles across to Fraser Island. The other morning the barge did not stop at the Point but went straight across to Fraser Island. There were large numbers of birds all packed into a small area. 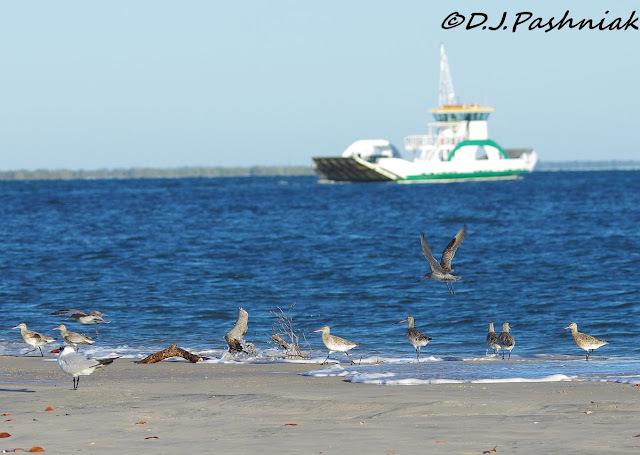 A few birds were feeding away from the rest of the flock and walking close to the water. 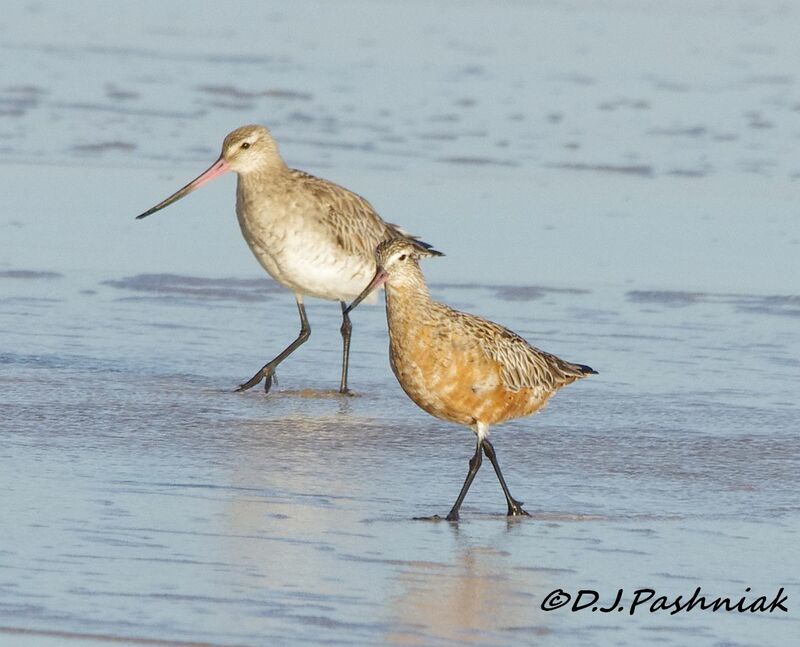 This photo shows Bar-tailed Godwits and a Caspian Tern. 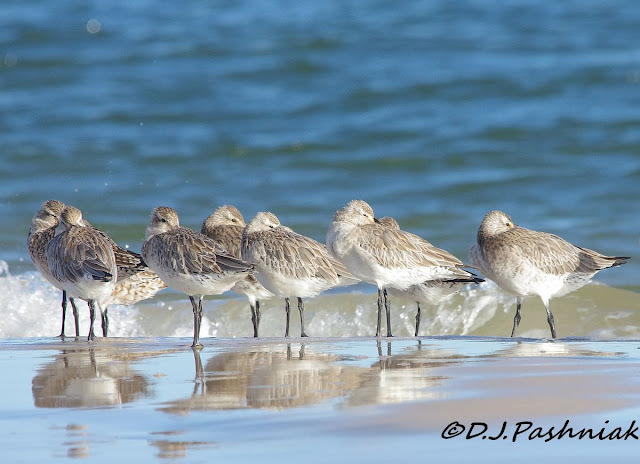 I took numbers of photos of this tightly packed group of birds. I thought that I would at least be able to see some of the individuals that made up the flock when I put the photos up on the computer. I will not deliberately disturb a roosting flock of birds. 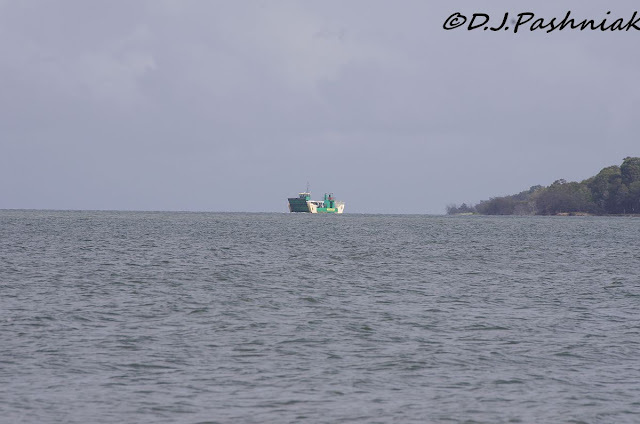 However, the barge had returned to the Point and I knew there would soon be traffic across the sand. The first vehicle was a Ranger's vehicle for the National Park. He was very good and waited for me to finish the photo I was taking, then drove slowly past and kept as far away from the birds as possible. The next vehicle also drove slowly and away from the birds. 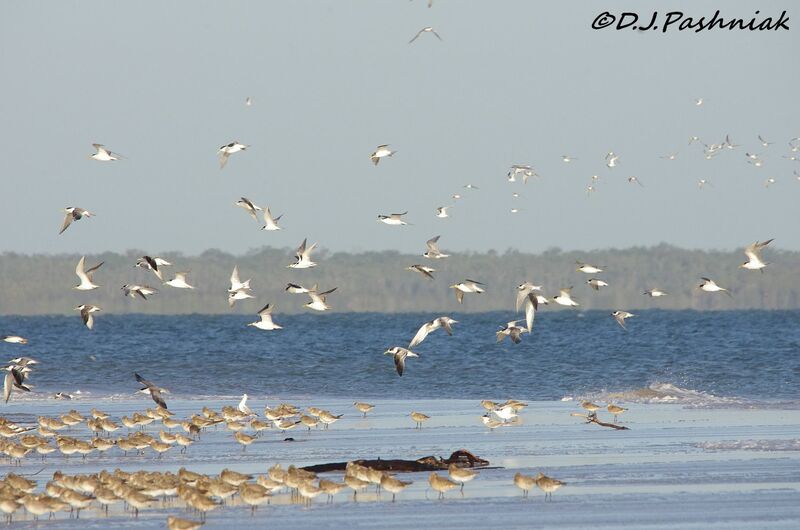 However, the next one drove fairly fast right down the middle of the sand and all the birds were disturbed! Yes, it's legal - but it's frustrating for the bird watcher and I wonder what the birds think about it! Some of the flock flew off to find somewhere else to roost and numbers of them went right out to the end of the point and packed in there on a very small amount of sand. 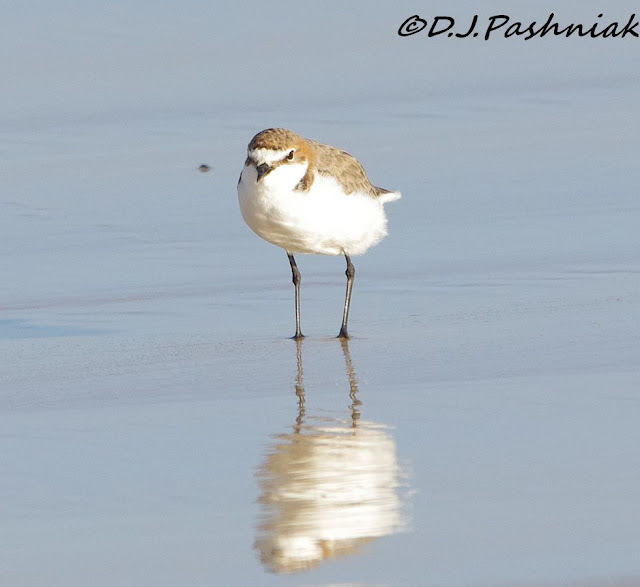 A few flew down and rested right on the edge of the sand and close to the water. There are always numbers of Red-capped Plovers and Red-necked Stints. I have lots of photos of these birds but can never resist trying for more. These little birds are so tiny and cute! 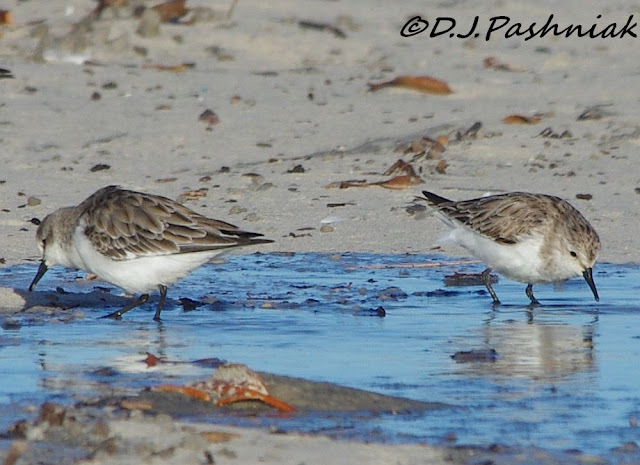 They also seem much less concerned about getting close to a bird watcher and will even walk closer when they are hunting across the sand for things to eat. There were also large numbers of medium sized birds in amongst the larger Godwits. However, I am going to post about those next week. I am unlikely to be able to get out again this week. We have just had 234mm (that is more than 9 inches!) of rain in the last two days. It is still raining this morning but not nearly so heavily. The Bureau of Meteorology is predicting showers for at least the next seven days. We are cut off from Gympie again, and the highway south of Gympie is also cut. Part of the central business district of Gympie is going underwater again this morning. This is the third time since the new year! Even for the tropics this is excessive! 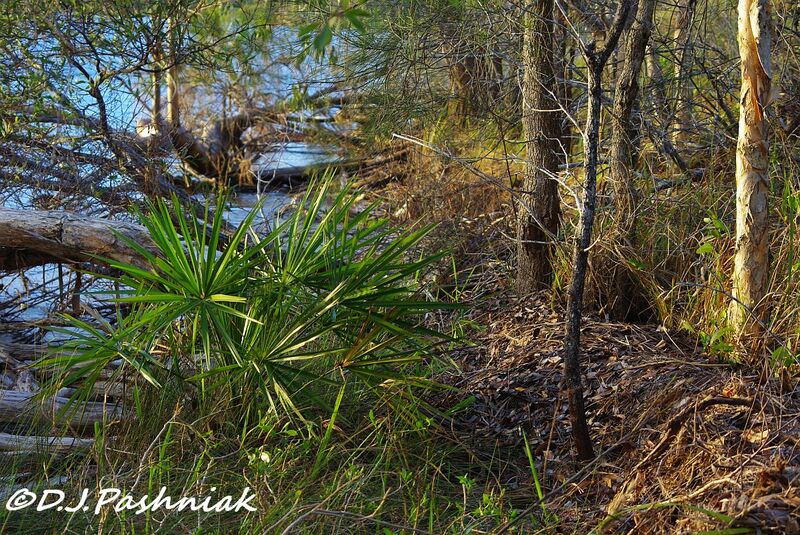 I am posting photos that I took more than a week ago because the weather has been too bad to get out with the camera. Yesterday and last night I measured a total of 172mm in my rain gauge in the back yard. That is nearly 7 inches. The four days before that we got a total of 79mm - just over three inches. Once again my yard is one big puddle! Fortunately, it drains off pretty fast because the ground is mainly sand. 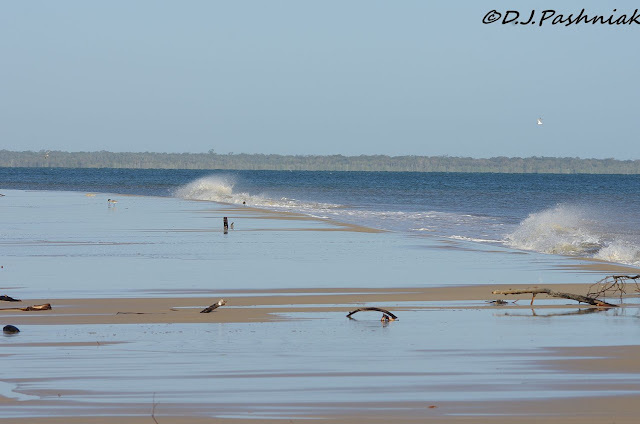 I went out to Inskip Point a couple of days after I took the photos I posted last week. It was again a very high tide but because it was later in the morning most of the birds had been disturbed and I didn't get any good bird photos. However, it was a lovely bright day and the scenery was great. 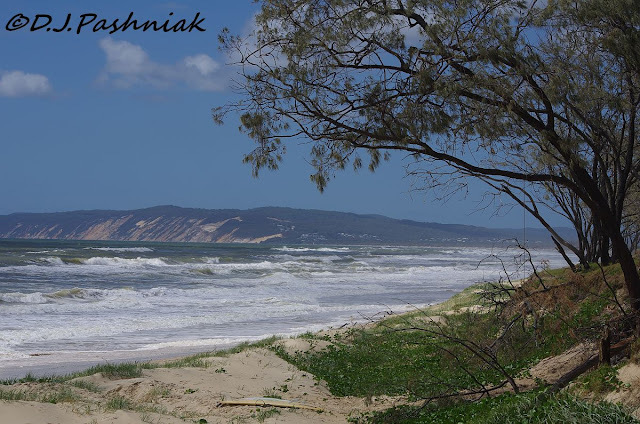 This photo is taken on the way out to Inskip where you can stand on top of the sand hills and look back towards Rainbow Beach. 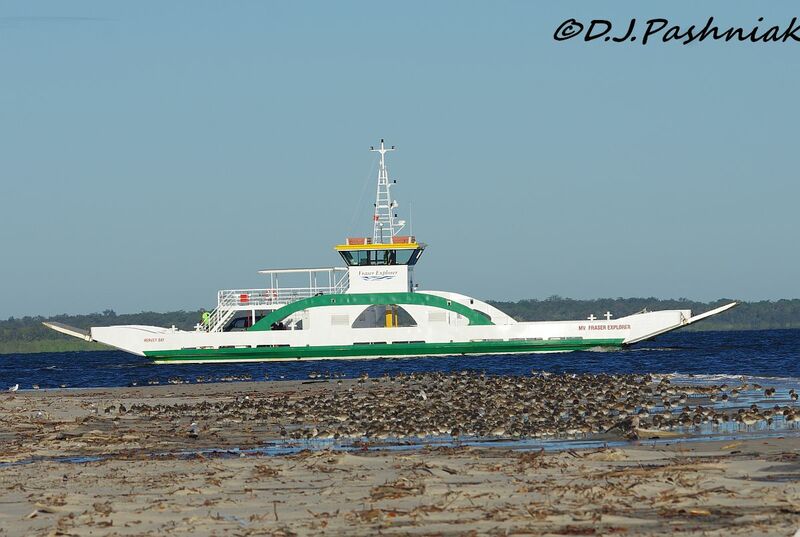 The Point at Inskip was covered with water but one of the 4 wheel drive buses that takes tourists around Fraser Island drove through the water and then the barge took them over to Fraser Island. I photographed these birds on my previous day at Inskip Point. There were quite large flocks of Terns roosting with the Shorebirds. 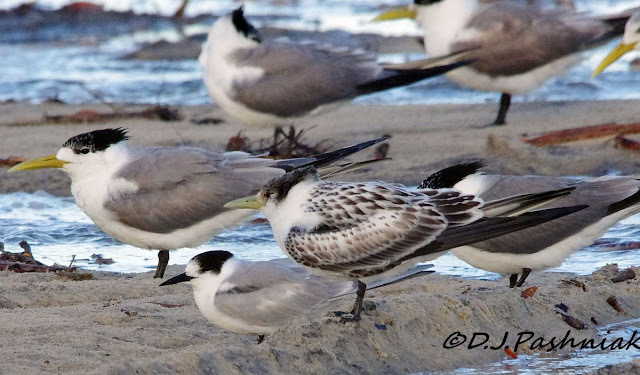 This photo is of an adult Crested Tern on the left, a Common Tern standing just in front of it and then a juvenile Crested Tern with the lovely "spotty" plumage of a very young bird. As usual there were small shorebirds running around amongst all the larger birds. 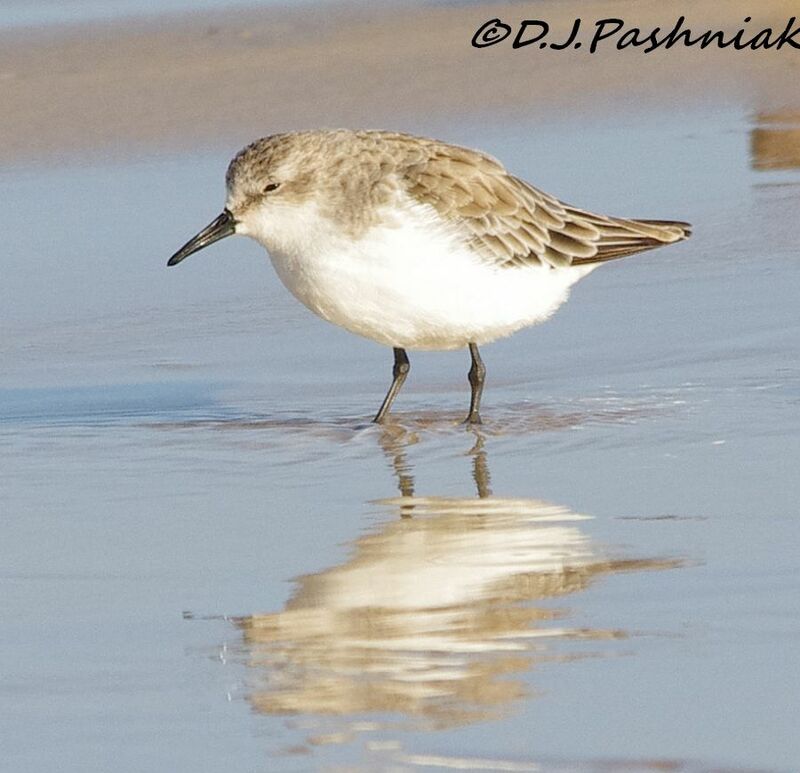 and a Red-necked Stint - looking as if it did not want to be disturbed! 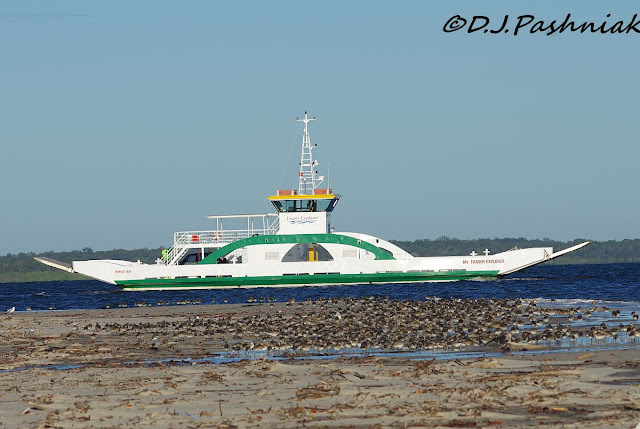 I went out to Inskip late last week. 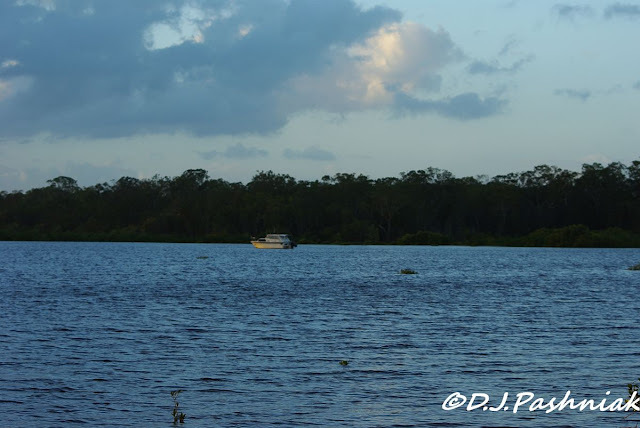 It was a high tide early in the morning and I was out there before anyone else - even before the barge to Fraser Island arrived! 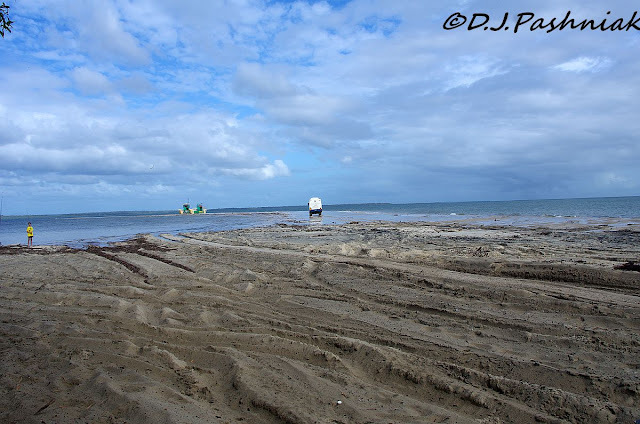 Although the tide was high it was not the highest tide of the cycle. 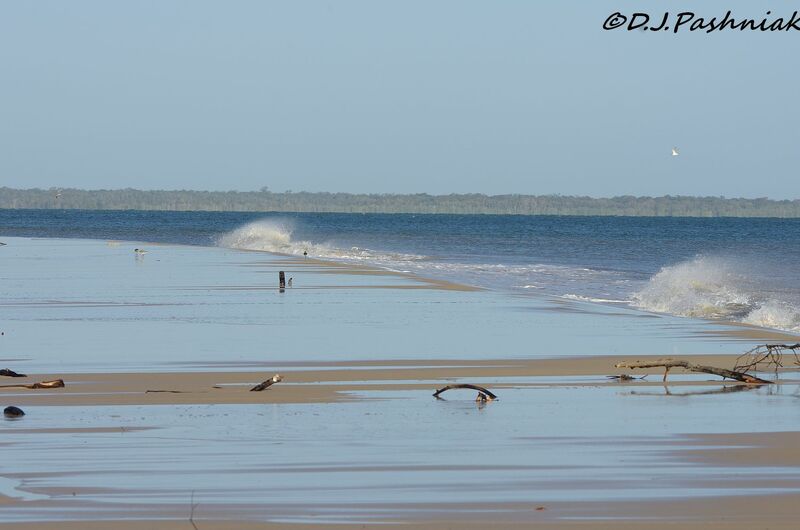 However, there was water washing over most of the sand spit. 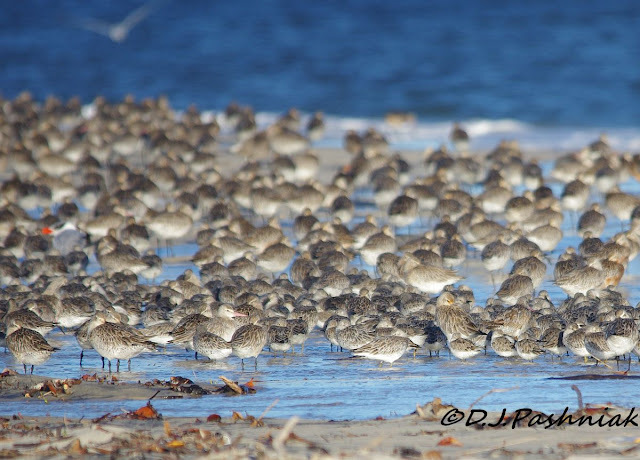 There were still a few places where the shorebirds could roost out of the water and they were packed onto these bits of higher sand. 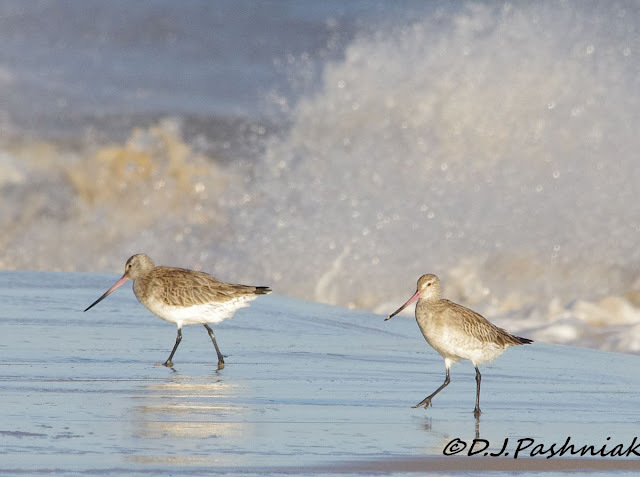 As the waves came over the sand there was fairly constant movement as the birds jostled for room and even flew up for a few moments. 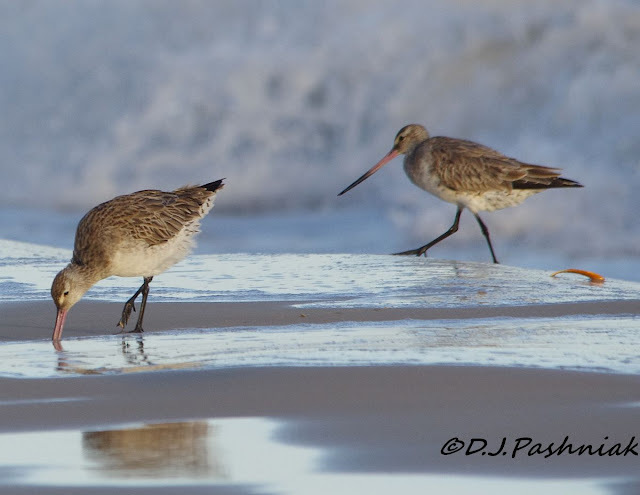 The waves left a thin film of water over the sand and there were a few Bar-tailed Godwits that kept busily hunting for food in this wet - and softer - sand. 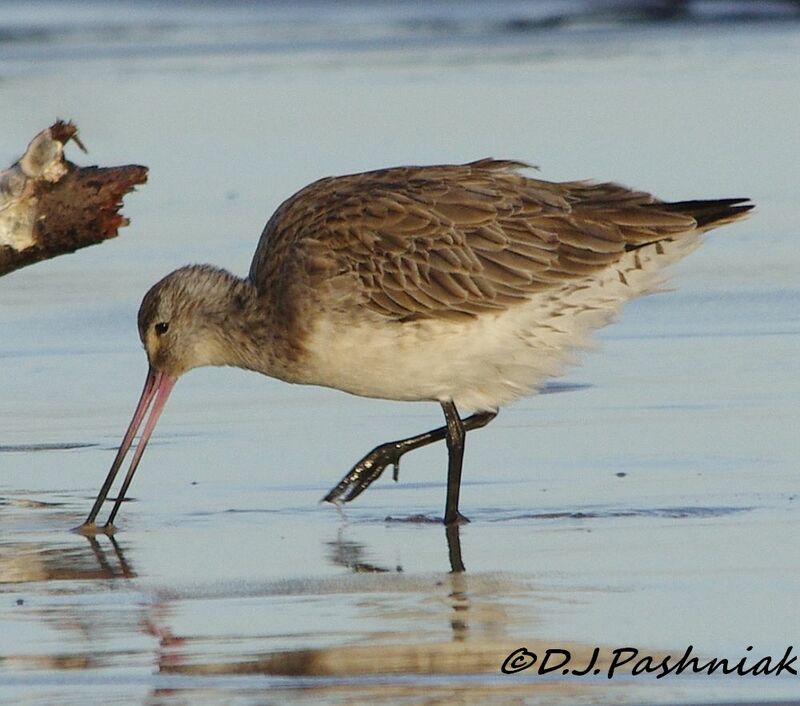 Birds with long slender bills like Godwits need the sand to be softer before they can probe into it for food. Some of them reminded me of the game children play when they see how close they can get to the breaking waves. There were a few Godwits showing early breeding plumage. Males usually change into breeding plumage first. The male is in the foreground of this photo and the female is walking behind him. Male Godwits are slightly smaller than females and their bill is slightly shorter. Extra to last week's post. 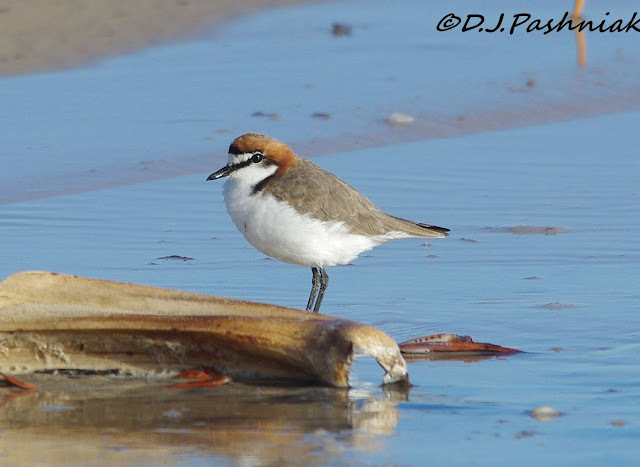 After I wrote the last blog post I read on the Birding-Aus forum that numbers of Sooty Terns had been blown by the storm into places all along the coast. Then this morning Denis from The Nature of Robertson sent me this link to an article from the Sydney Morning Herald about Sooty Terns that have been handed in to the wildlife hospital at the Taronga Zoo. There is a great little piece of video on the page and an interesting article about where the Terns have most likely come from. Thanks Denis, it's well worth a look. 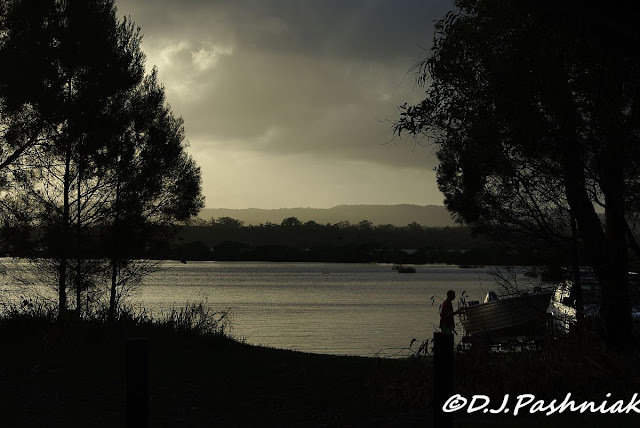 Soon after sunrise this morning I went down to the bay at Mullens for a walk along the foreshore. 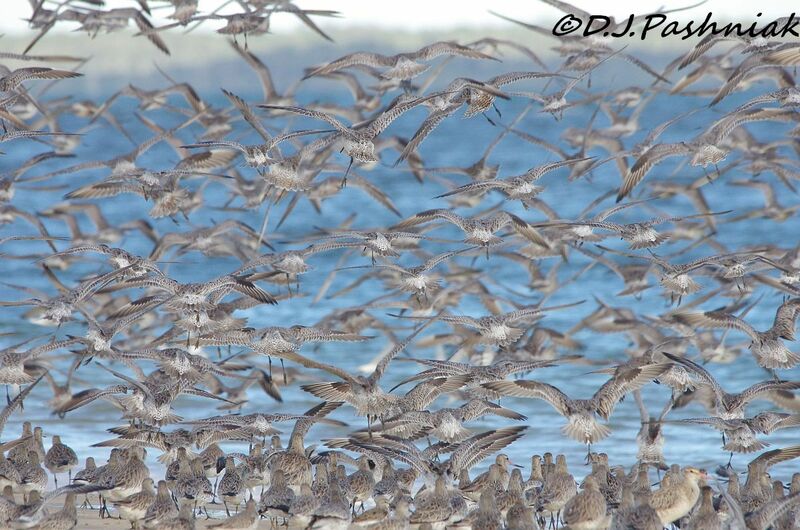 I hoped I would see some interesting birds for this week's blog post. However, I had not taken enough notice of the tide time or height and I found the little creek was too deep for me to risk walking through carrying my camera. The light on the bay at this hour of the morning is always beautiful so I did not count my very short walk as wasted effort. 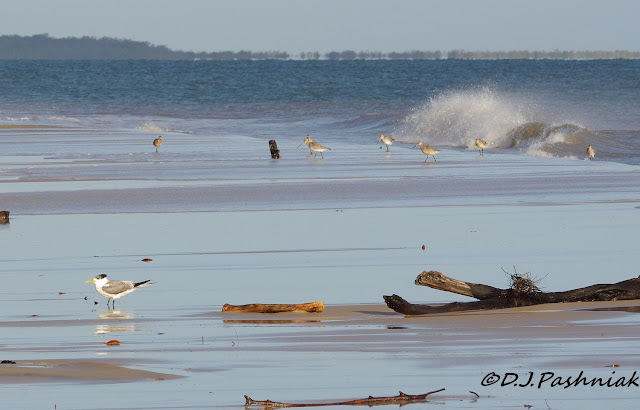 There were piles of leaves and sticks all along the shoreline where they had been dropped by the tide and the waves which were pushed in shore by the storm last week. These piles are lots higher than even the highest tides of the year would be able to push them. I was unable to find any interesting birds to photograph at Mullens this morning so I am posting some that I see regularly around my house. Brown Honeyeaters are around here nearly every day. They are tiny (12-16cm or 5-6+inches) but easy to find because of their very loud song. 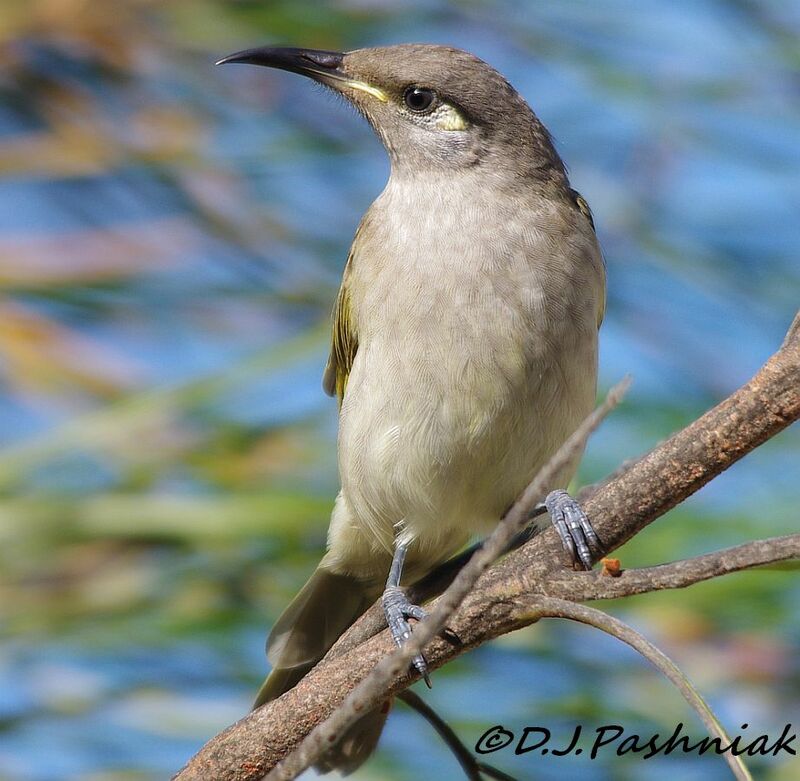 White-throated Honeyeaters are very similar in size (13-15cm) but not as easy to see. 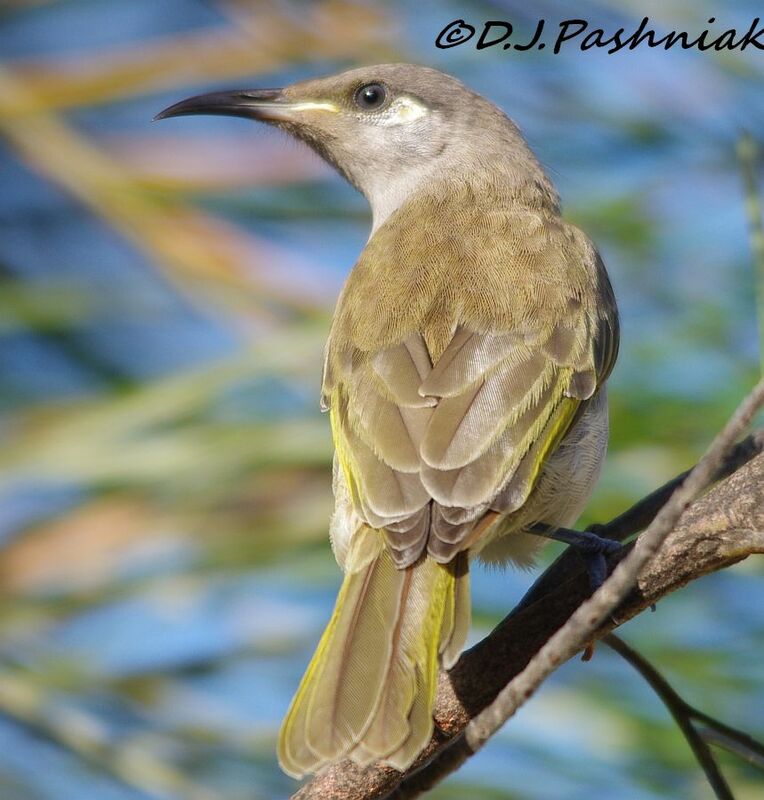 They are quieter and get chased off by the Brown Honeyeaters whenever they come into the same trees or bushes. 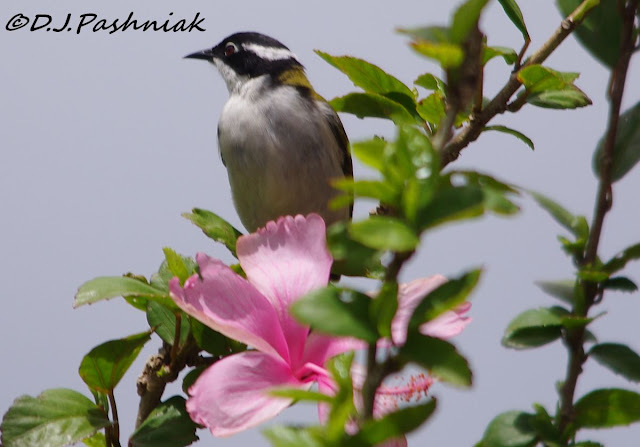 I seldom see the Brown Honeyeaters on the hibiscus flowers but the White-throated Honeyeaters seem to prefer them. This hibiscus is one of the older forms and the flower is smaller than most.